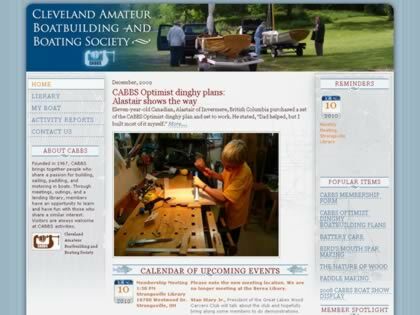 Top : Boatbuilders : Boatbuilding Projects Sail : C.A.B.B.S. Founded in 1967 by a collection of individuals who shared a passion for building and sailing small boats. Our goal has always been to satisfy this passion through the sharing of information about boat building, the promotion of home boat building and social events held throughout the community. Web Site Snapshot: If available, above is a snapshot of the C.A.B.B.S. web site at http://www.cabbs.org/ as it appeared when this site was added to the directory or last verified. Please Note that Boat Design Net has no involvement with the above web site; all content and images depicted in the above thumbnail are the property and copyright of C.A.B.B.S. unless otherwise noted on that site. Description: Founded in 1967 by a collection of individuals who shared a passion for building and sailing small boats. Our goal has always been to satisfy this passion through the sharing of information about boat building, the promotion of home boat building and social events held throughout the community.